Please call (610) 933-6919, by appointment only. We Can Even Custom Create A Fountain Just For You! 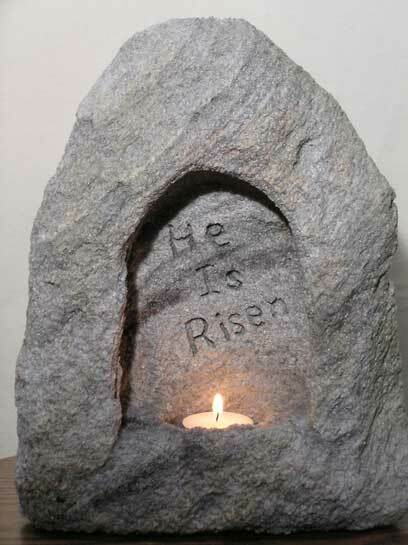 Double Cave Candle Holder cc204 Cave Candle® Holders For Your "Man Cave"
He Is Risen is such an incredible piece. The tea light illuminates each and every word. Our artist chisels the letters to make it appear as if “someone” had written this message on the wall for all to see. If you would like to have something else inscribed, just let us know. We will price it out accordingly. This piece stands 10″ to 12″ in height and 8″ to 10″ in width. These unique tabletop fountains are Individually hand-sculpted from volcanic rock by Charles Kern. Perfect for any indoor or outdoor setting! In just one 3-4 hour class, you will design, sculpt and take home your very own tabletop fountain. It will be an experience that you will never forget! Shop Hours: Please call 610-933-6919, by appointment only. Made in the U.S.A.! © Copyright 2018 Natural Creations, Inc.